This article is a brief report of the twitter response to WrestleMania35. I counted the tweets that contains #Wrestlemania during the Wrestle Mania 35 show. Actually, WM35 started at 17:00 (EST) in April 7th and ended around 0:00 April 8th. 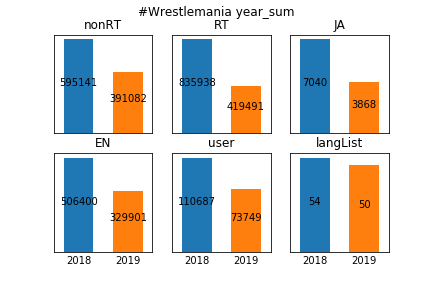 Due to my tweet search specification, it it hard to analyze the data that continues over two days and I counted tweets from 0:00~24:00 for April 8th in Japan (which contains full show of WM35). 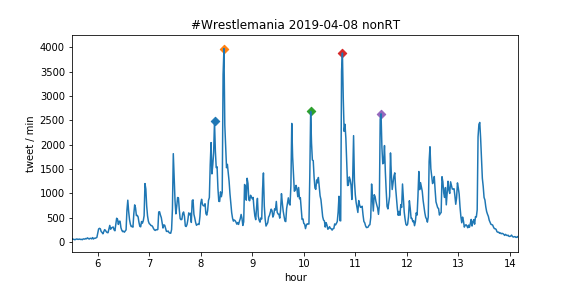 Above figure shows the change of the number of tweets posted with #Wrestlemania. The horizontal axis shows the time in JST (you can translate it to EST by +11hours). ◆ marks show the top 5 points that many tweets were posted. I also counted tweets in WM34 and compare them as shown below. "nonRT" means the total value of the normal tweets. "RT" means that of the retweets. "JA" means that of the Japanese tweets. "EN" means that of the English tweets. "user" means the total number of users that tweet with #Wrestlemania. "langList" means the total number of the language that are tweeted. As a result, all kinds of values in WM35 are reduced from WM34. I am not native English speaker and this report may be too brief for you to understand. If you have any question, please comment below this article or tweet to me in twitter. (I would be glad if you click below banner which links to a blog ranking community in japan.